Show me the money!!! Or at least explain the exchange rate. 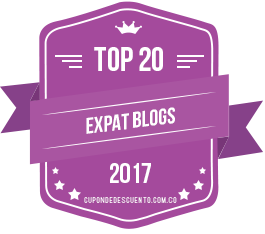 | Barranquilla or Bust! Show me the money!!! Or at least explain the exchange rate. $20,000 peso bill, back and front. $1,000 peso bill. $5,000 peso bill. My niece recently gave me a lesson in how to tell if bills are counterfeit. One of the challenges for a NorteAmericano in Colombia – at least for one like me who is not so great at mathematical estimates – is the exchange rate. 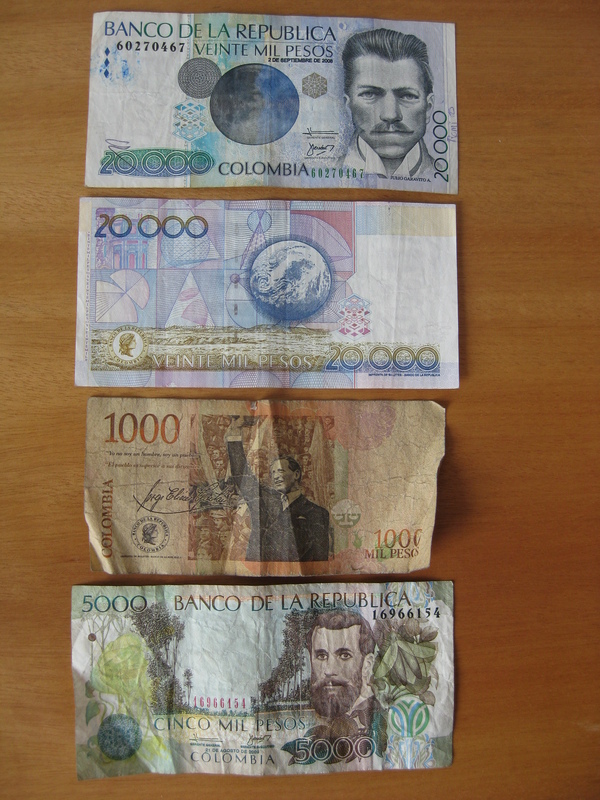 Right now, it’s roughly 1,800 Colombian pesos to the dollar. So a bottle of Coke might be $3,000 (the symbol for the peso is the same as for the dollar – $) and your groceries might cost $248,000. We bought a queen size mattress the other day and the cost was over $1 million. It’s hard not to feel an initial sense of shock when you hear the number. There is an easy way to get an estimate: just half the Colombian number, move the decimal point three digits to the left, and remember that the number you come up with is a little low. So that $3,000 Coke is a little more than $1.50. Whew! 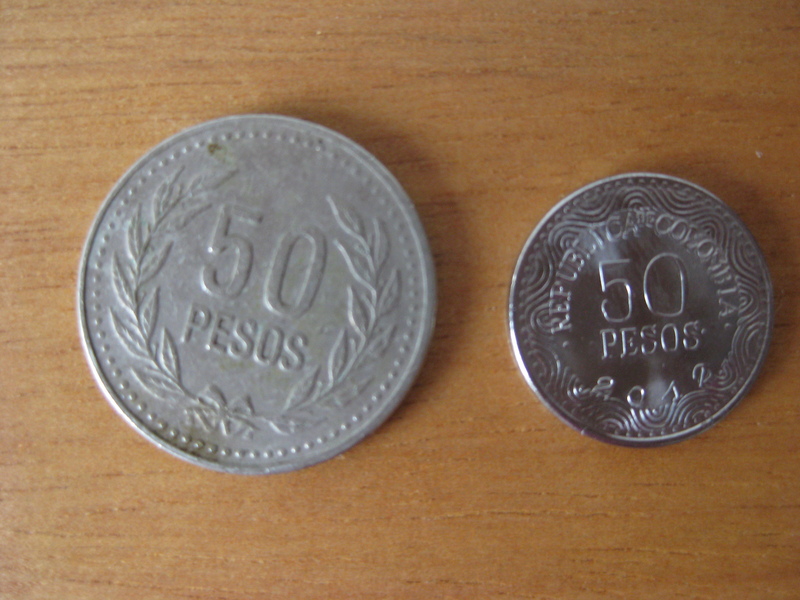 Old Colombian “50 peso” coin, alongside newly adopted smaller “50 peso” coin. As for using debit and credit cards, that has its own interesting nuances. If you are using a Colombian credit card – and I still haven’t wrapped my head around this entirely – you basically set your own monthly payments. For example, if you go to the grocery store, the clerk will ring up your total and then ask, “How many payments?” You can break whatever the total is – even if it’s something really small – into however many monthly payments that you want. If you’re a foreigner using a U.S. debit or credit card, you’ll be asked the same thing, only I think for us the question is moot since the bank sets the monthly payment for you. This whole “cuota” (“quota”) or payment thing led to much confusion when we were trying to use our card to buy the appliances for our apartment. (Yes, you have to buy things like a refrigerator, water heater, and air conditioners even when you are renting!) We expected to be able to pay in monthly installments — I thought the store would charge a certain amount to our credit card every month until it was paid off — but not so. If the card were Colombian, we could set the number of payments for that purchase, but the entire amount of the purchase would be run at the time of the sale, just like in the U.S. Speaking of credit cards, if you’re a tourist doing tourist stuff (paying for hotel, restaurants, tours, etc. ), you’ll probably have no problem whatsoever using your U.S. credit or debit card. But if you decide to move here, watch out! Your bank will probably repeatedly shut your card down under suspicion of fraud (both Colombia and the U.S. have strict controls related to financial transactions between the two countries due to narco-trafficking), even though you’ve repeatedly told your U.S. bank that YOU ARE NOW LIVING IN COLOMBIA! Inevitably, the bank will shut your card down when you are in a rush and are at the store where you only have your Colombian cell phone and thus cannot call your U.S. bank to have them turn your card back on, and so you will have to take multiple cab rides to accomplish the purchase. One more bizarre credit card factoid: as a fraud prevention mechanism, stores are not allowed to key in your credit card number. They have to actually swipe your card. So keep that magnetic strip in good condition my friends, lest it let you down just when you need it most! 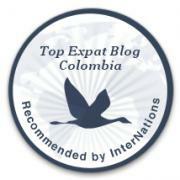 This entry was posted in Daily Life and tagged adventure, barranquilla, Colombia, Colombian peso, credit card, currency, exchange rate, financial services, international, Latin America, travel. Bookmark the permalink. Pingback: International Relocation Meets Major Home Renovation | Barranquilla or Bust!